Te Lumanaki O Tokelau I Amelika I (otherwise known as Lumanaki) is a Tokelauan Language & Culture School that meets on Saturdays at 9:00am at our Te Taki Community Center 95-028 Waihau St. Mililani, HI 96789. This language and cultural program is open to children of all ages and to adults of all ages. 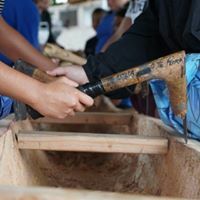 Ta Le Vaka (to carve a canoe, in the 'old' Tokelau languge): The carving of the Tokelau vaka under the direction of the TaVaka (Master Carver) provided first hand experience in witnessing the vanishing art of traditional canoe carving. 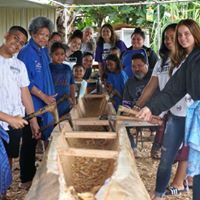 How to use traditional tokis (adzes), the proper harvesting of the kanava tree, the various parts of the Tokelau vaka, to fishing knowledge that includes seasons and phases of the moon for harvesting specific types of ika are passed on to students. Taumaka (to sail, tack to and fro): Once the Tokelau vaka is launched in the North Shore of O'ahu, the Taumaka sessions will be in full swing. Lumanaki sessions will join the larger Community gatherings in the North Shore once a month to learn about the usage of the Tokelau vaka in the ocean and its important role in the survival of Tokelauans in the islands. The sharing of fishing traditions and techniques, preparation of food sourced from the surrounding ocean, Tokelau fatele (traditional dancing) and many other exciting activities will be happening during the Taumaka monthly outings. If you or anyone you know is interested in learning the Tokelau gagana (language) and aganuku (culture) we welcome one and all to join us! Yes, I am interested in learning the Tokelau gagana (language)! Thank you! Someone will be in touch with on dates and locations of our classes.